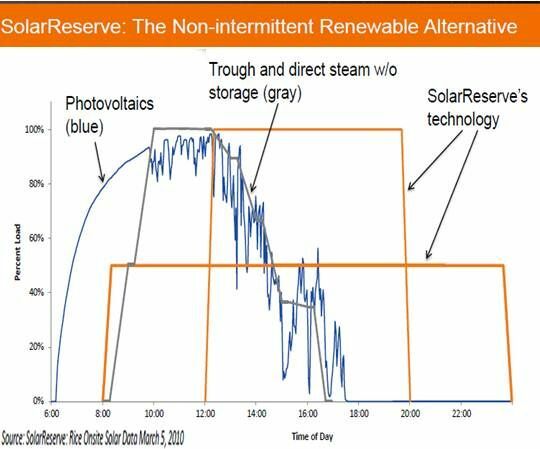 Is SolarReserve CEO Kevin Smith right about BrightSource’s steam-to-salts storage? The race for the lead in concentrating solar power (CSP) development accelerated in recent weeks with major advances from SolarReserve, BrightSource Energy and Abengoa, the three primary contenders. Each advance moves solar power plant technology closer to its future. BrightSource Energy (BSE) got final California Public Utilities Commission (CPUC) approval of revised twenty-year power purchase agreements (PPAs) with Southern California Edison (SCE) (NYSE:EIX) for a 250-megawatt power tower project at its Rio Mesa site and for a 250-megawatt tower project at its Sonoran West site with two hours of storage capacity. BSE will deploy its next-generation technology at Rio Mesa, scheduled to go into service in 2015. Sonoran West, scheduled for completion in 2016, will be BSE‘s first use of its steam-heated molten salts storage system. Spain’s Abengoa (PINK:ABGOY) began construction on two South African CSP projects. 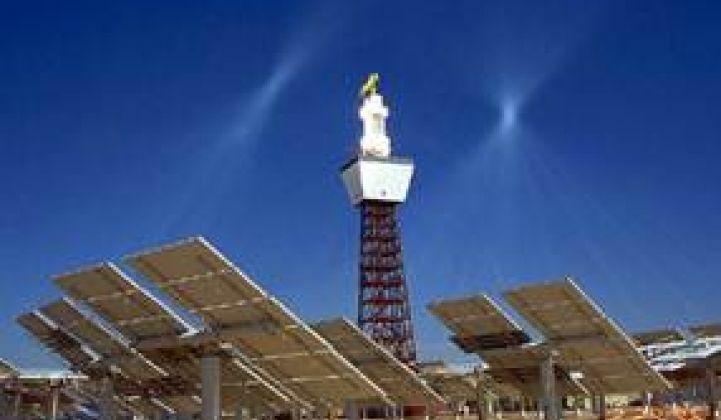 Both Khi Solar, a 50-megawatt power-tower project with two hours of storage, and KaXu Solar One, a 100-megawatt parabolic trough project with three hours of storage, won long-term PPAs from South Africa’s publicly owned Eskom utility in competitive bidding. Both are expected to be operational in 2016. Abengoa had “a bit of a head-start,” Smith said. “We weren’t quite ready with CSP so we bid our PV projects. They are a bit easier to permit.” But SolarReserve’s 100-megawatt Redstone CSP project with storage is now fully permitted and will be bid in the May 2013 round, Smith added. The molten salts used by all three technologies to store heat solidify at just below 500 degrees F, Smith explained. Power towers get their fluids, compressed steam for BSE and molten salts for SolarReserve, to over 1000 degrees F, allowing almost twice the heat to be transferred for storage. 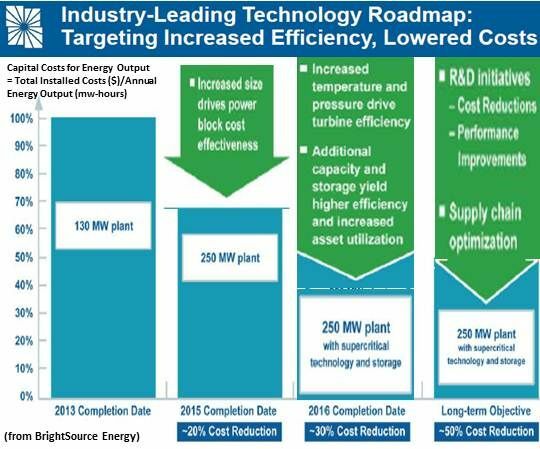 “Our direct competitor is BrightSource Energy,” Smith said, and he believes SolarReserve’s Pratt &Whitney-Rocketdyne technology is ahead. BSE has repeatedly said it is following its own roadmap, though its timeline matches Smith’s claims and SolarReserve’s 110-megawatt Crescent Dunes project, which will have ten hours of storage, remains on schedule in northern Nevada. It has a twenty-year PPA with Nevada Power with a publicly announced PPA rate of $0.135 per kilowatt-hour. BSE uses solar-heated compressed steam to drive a turbine. For storage, it will use the steam to heat molten salts. SolarReserve uses the sun to directly heat molten salts. Both will release the stored, heated salts to create steam that, even in the absence of sun, can drive the plant turbine and generate electricity.